You can create a free website with your own domain name and free web hosting. Domain and hosting are two important parts for a website to come live on the internet. Getting your domain name and hosting is easy these days. Many people Google free website hosting and domain. But they won’t get what they want. Well, you have come to right place. I am going to explain to completely on how to get free domain and hosting. There are two methods to get your website online. You don’t have to pay for google web hosting price. google free website hosting and domain(blogspot.com). Own .tk domain and a free web host. The first method is easy to deploy but the second method needs some work. Work means you don’t need technical knowledge. You have to just follow the steps correctly. If you don’t you will run into trouble and you have to restart again. Here I will explain how to use google free website hosting and domain. 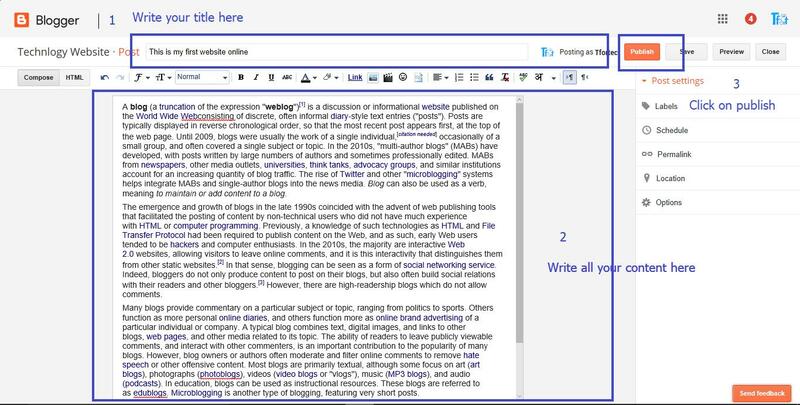 Google owns blogger which is a blogging platform. You can make use of it. Please follow the steps to get your first website online. You can use this google web hosting for small business. google web hosting plans are free as always. Please remember that Blogger is owned by Google. The first step is to make a google account. You should have a google account in order to create your first website. 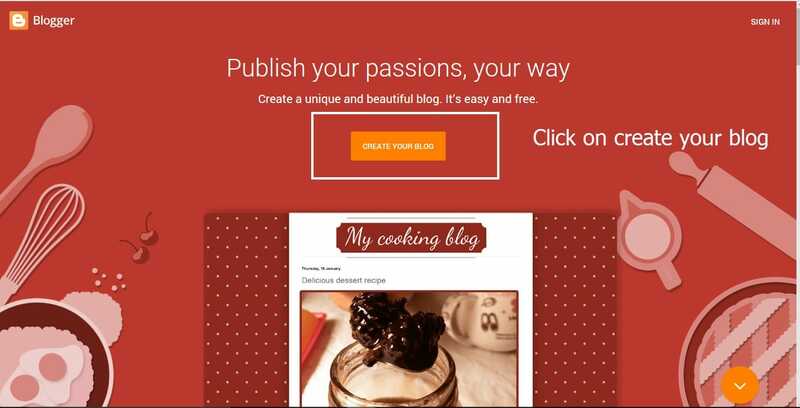 You can also create a free account at blogger. It will ask for your Google account. You have to sign up for a Google account or you have to just log in. 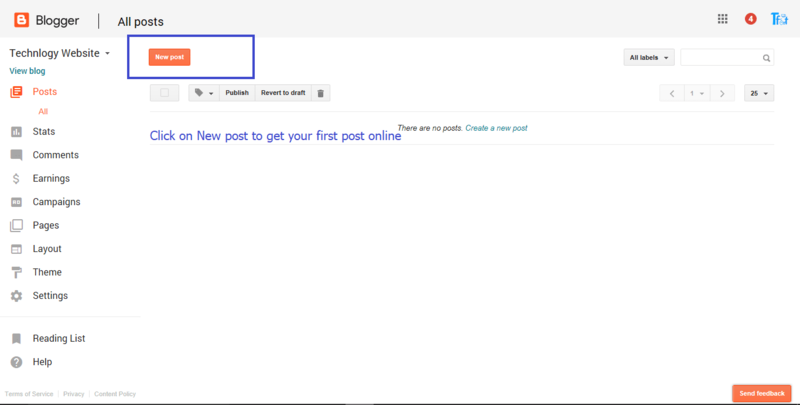 You are going to see the dashboard of blogger. It will ask the title, domain name and theme for your website. 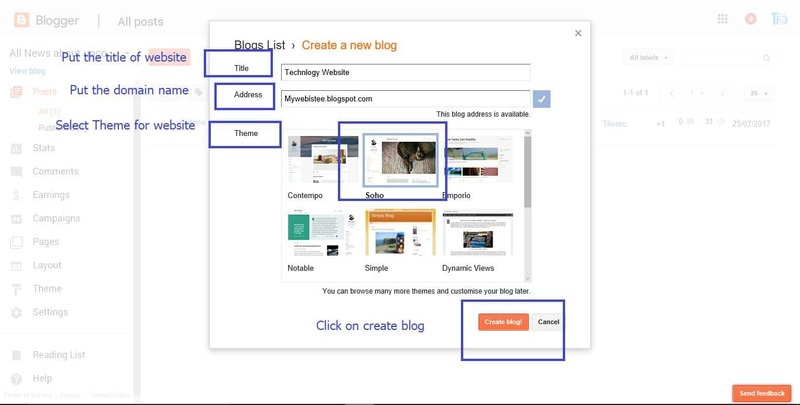 Enter all the details and click on create a blog. Congratulations, Your first website is online now. The website is nothing without content. Now you have to create content for your website. Click on New Post. Now you are in create post section. Put your title of your article and write content on the content section. You can change the style, add images, add links. All those features are available below the title. After writing the article just press Publish button. 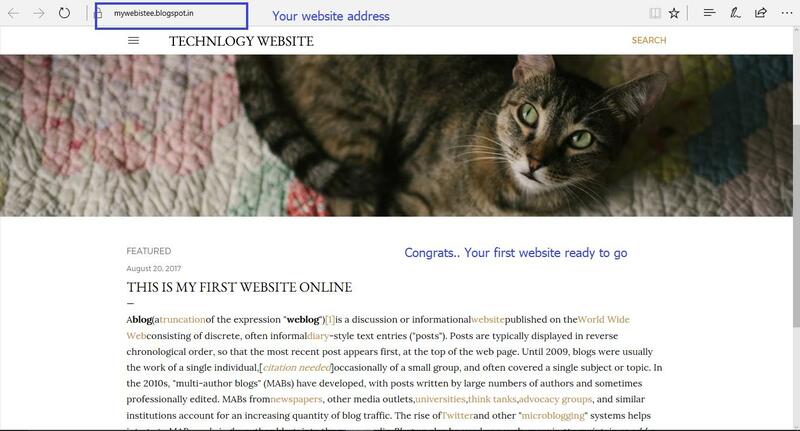 You can access your first website through the domain name you have given while creating a blog. 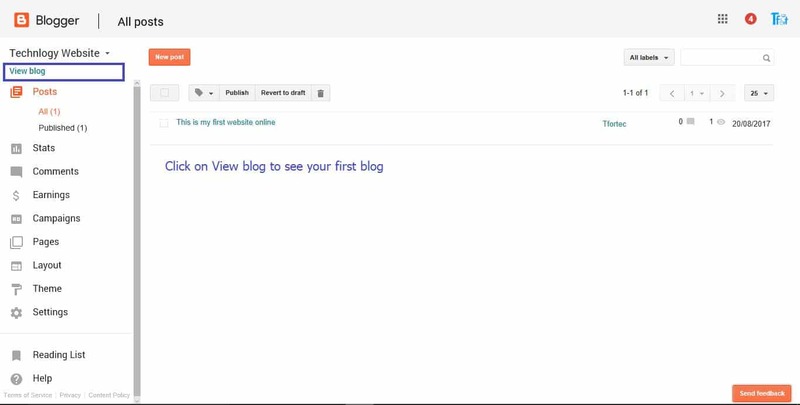 You can just view your website by clicking on view blog. There are a lot of menus in the dashboard to get more insight on it. You can see comments on comments tab. You can also see traffic which tells you how many visitors are visiting stats. Congratulations, Your first website created successfully. You can earn a lot of money with your website by integrating Google Adsense. I will write a separate article for that. Remember there is no cost on google web hosting services. You can also use free website hosting and domain name registration customised. It’s somewhat technical. I will make a separate article for that. Google free website hosting and domain available to all countries and free. If you are a newbie you can just get to know all about these by experimenting above steps. Get to know how to create a website of your own. You can also use WordPress to create your website as same. If you are a newbie google is preferred as it will fetch you more traffic and indexing will be faster to get you fast in search engines. If you are creating a customised website then WordPress is a better choice. I will make an article on that. In India get the online free website in this way. I will write a tutorial on how to get a free .tk domain and use free hosting and launch your website on WordPress. Please stay tuned. and subscribe and LIKE Facebook page so that I will be encouraged. Thanks for reading.